Home PUBLICATIONS Images tell changes in San Donato Mil. Images tell changes in San Donato Mil. 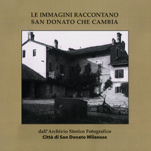 This is the catalogue of the exhibition promoted by Culture Committee of San Donato Administration and exhibited in the Contemporary Art Gallery – Cascina Roma in September 2006. This exhibition concerns the photos of S. Donato Milanese Historical Photographic Archives. The photos fill a period of about 90 years from 1920 up to today. Roberto Rognoni in 1999 promoted the creation of these archives, of which he has been the trustee since 2000. All photos published here are by Roberto Rognoni.